Mr. N. Jehangir, Vice Chairman and Managing Director, NeST Group of Companies was selected for the coveted ELCINA Award for Entrepreneurial Excellence considering his contributions in setting up world class high technology manufacturing business with largest electronic export from an industrially backward state like Kerala. 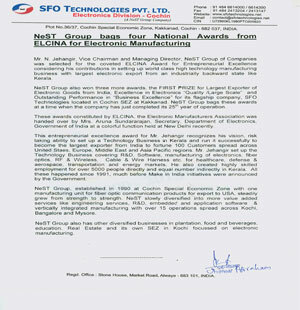 NeST Group also won three more awards, the FIRST PRIZE for Largest Exporter of Electronic Goods from India, Excellence in Electronics “Quality /Large Scale” and Outstanding Performance in “Business Excellence” for its flagship company, SFO Technologies located in Cochin SEZ at Kakkanad. NeST Group bags these awards at a time when the company has just completed its 25 th year of operation. 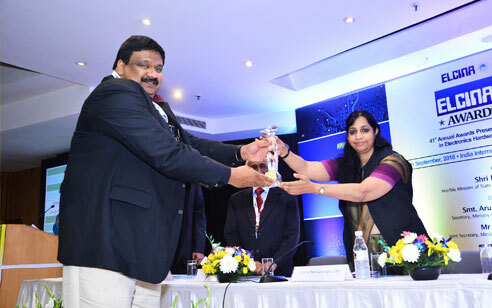 These awards constituted by ELCINA, the Electronic Manufacturers Association was handed over by Mrs. Aruna Sundararajan, Secretary, Department of Electronics, Government of India at a colorful function held at New Delhi recently. This entrepreneurial excellence award for Mr. Jehangir recognizes his vision, risk taking ability to set up a Technology Business in Kerala and run it successfully to become the largest exporter from India to fortune 100 Customers spread across United Staes, Europe, Middle East and Asia Pacific regions. Mr. Jehangir set up the Technology Business covering R&D, Software, manufacturing of electronics, fiber optics, RF & Wireless, Cable & Wire Harness etc. for healthcare, defense &aerospace, transportation and energy markets. He also created highly skilled employment for over 5000 people directly and equal number indirectly in Kerala. All these happened since 1991, much before Make in India initiatives were announced by the Government. NeST Group, established in 1990 at Cochin Special Economic Zone with one manufacturing unit for fiber optic communication products for export to USA, steadily grew from strength to strength. NeST slowly diversified into more value added services like engineering services, R&D, embedded and application software & vertically integrated manufacturing with over 15 operations spread across Kochi, Bangalore and Mysore. NeST Group also has other diversified businesses in plantation, food and beverages, education, Real Estate and its own SEZ in Kochi focussed on electronic manufacturing.